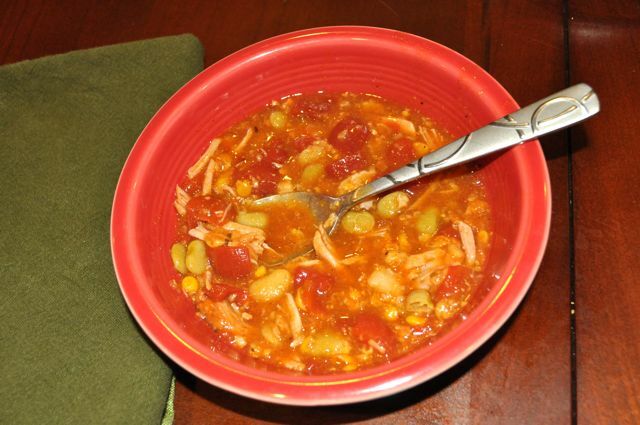 A classic Southern tangy soup that’s super easy to make in your slow cooker. The barbecue sauce, ketchup and Worcestershire sauce give it a tangy and sweet flavor that fills the whole house with a comforting, warm aroma. Mmmm…I wish you could smell the tangy aroma coming from my kitchen right now (one day that’ll probably be possible!). 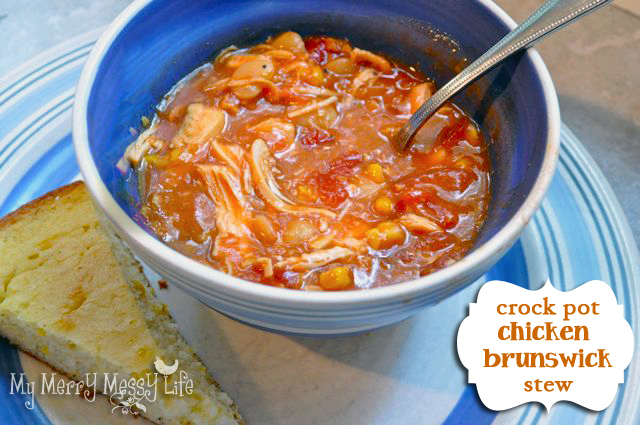 But for now, I’ll share one of my favorite recipes that comes from my Southern heritage – Chicken Brunswick Stew. Being the Georgia girl that I am, my grandmama use to make the most heavenly stew you’ve ever tasted. (It was our family tradition to have it every July 4th, which I never quite understood because anyone who’s been in Georgia in the middle of July knows that it’s stinking stanking HOT! For me, this is a wintertime delight.) Back to Grandmama – she was quite the Martha Stewart of her time, one of those that wore her pearls, always had dinner on the table for Grandaddy, could sew better than a “Project Runway” designer, and enjoyed ironing! And I, my dear, am sadly NOT one of those women. 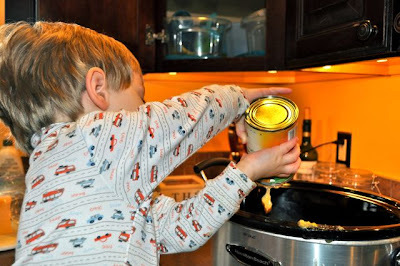 Cooking I could do without, but it is a necessity, so therefore, I do my best to find easy, yummy and nutritious meals for my family. I’ll give you my easy, no fuss version of the stew, and then my grandmama’s. An added bonus is my toddler LOVES to help me dump all the ingredients in – keeps him occupied and we still get to eat a yummy dinner! A classic Southern soup that’s hearty, tangy and delicious and super easy to make in your slow cooker! (Make sure the chicken is defrosted before putting in your slow cooker). 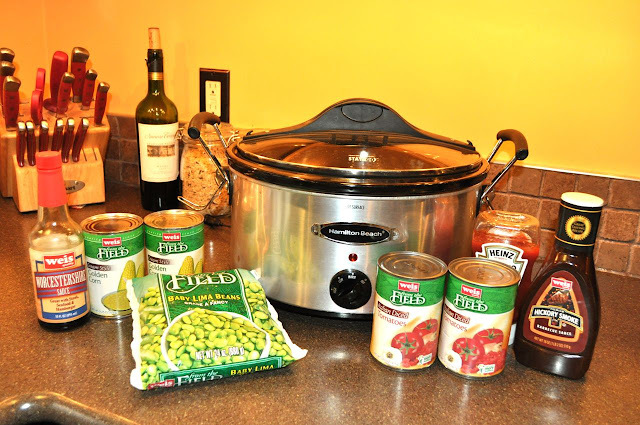 Place all ingredients in your slow cooker and stir well. Turn the cooker on high and cook for four hours, or cook on low for 8 hours. Enjoy with some Southern-style cornbread! Have fun dumping all the ingredients into your [amazon_link id=”B001AO2PXK” target=”_blank” ]slow cooker[/amazon_link], but put the chicken in first on the bottom. Cook on low for 8 hours or on high for 4-5. You’ll know it’s finished when the chicken easily shreds apart by mashing it with a fork. Turn off the [amazon_link id=”B001AO2PXK” target=”_blank” ]slow cooker[/amazon_link] and wait 15 minutes or so for it to cool down. Enjoy with your favorite cornbread! If you’re more of a real cook than me, then check out my Grandmama’s version where it cooks for two days!